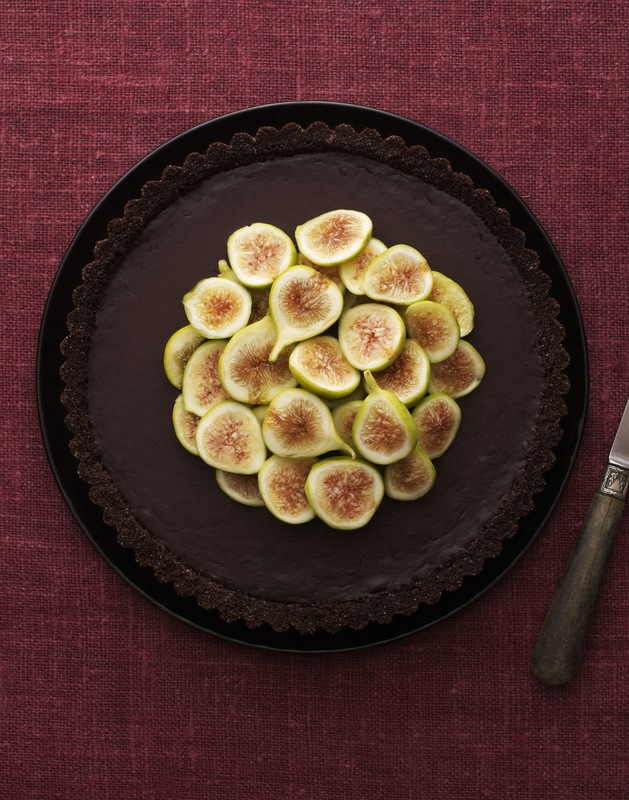 Thanksgiving Pie Update: Dark Chocolate–Fig Tart Recipe! / Hey, EEP! Thanksgiving Pie Update: Dark Chocolate–Fig Tart Recipe! There will always be a place for apple, pumpkin and chocolate pudding pie on our Thanksgiving table! But my lovely friends have already started asking me about new, modern twists on traditional pies they can whip up for the big day. This dark chocolate tart is elegant and rich, a perfect addition to your fall dessert spread. Give it a try! 1. Make the crust: Preheat the oven to 350˚. Pulse the graham crackers in a food processor until finely ground. Add the butter, sugar and salt and pulse until the mixture resembles wet sand. Press into the bottom and up the sides of a tart pan with a removable bottom. Bake until set, about 10 minutes. Let cool completely. 2. Meanwhile, make the filling: Put the bittersweet and dark chocolate in a heatproof bowl. Bring the cream to a boil in a saucepan over medium heat; pour over the chocolate in the bowl and let sit 5 minutes. Stir the chocolate mixture until smooth. Whisk the eggs, vanilla and salt together in a separate bowl; stir into the chocolate mixture. 3. Pour the filling into the prepared crust. Bake until the filling is set around the edges but still wobbly in the center, 20 to 25 minutes. Let cool completely. To serve immediately, arrange the figs on top of the tart and drizzle with honey, if desired. Or refrigerate, covered with plastic wrap, for up to 1 day.